Toyota Land Cruiser Prado 150 2009-2013 Android In-Dash Car Stereo DVD GPS Head Unit - a car multimedia system which significantly extends functions of your car compared to the baseline. 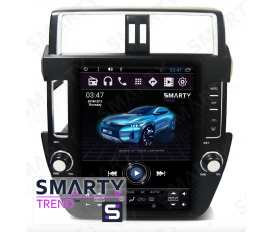 All Android Car Stereo GPS units for Toyota Land Cruiser Prado 150 2009-2013 in our store has original factory design and produced with using of high quality materials. Capacitive multi-touch screen will let you control car multimedia system very easy and safely for you and your passengers. After installing Toyota Land Cruiser Prado 150 2009-2013 Android Car DVD unit you will not lose factory functions such as steering wheel control buttons, information from climate control system, original factory parking assistance system and rear view camera.